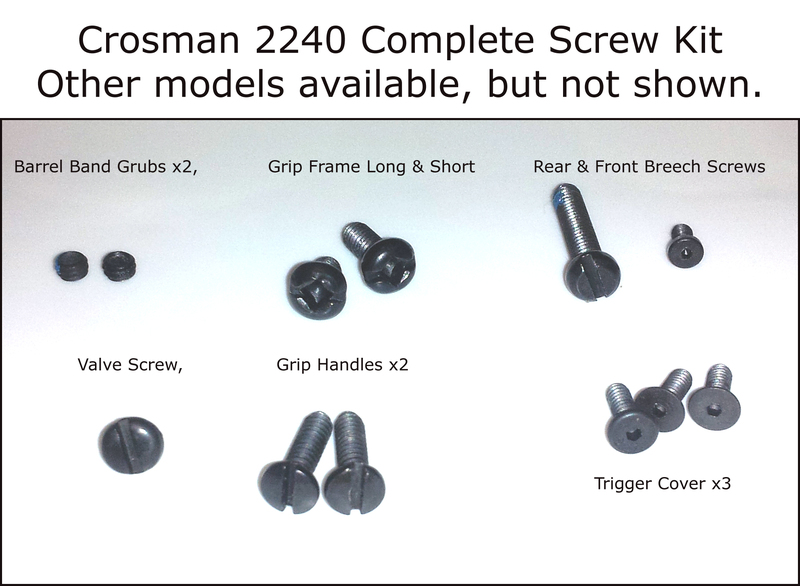 I am currently offering several different screw kits for the Crosman lines that I support. I have OEM screw kits for the 2240 2250 2260 1322 1377 2289. 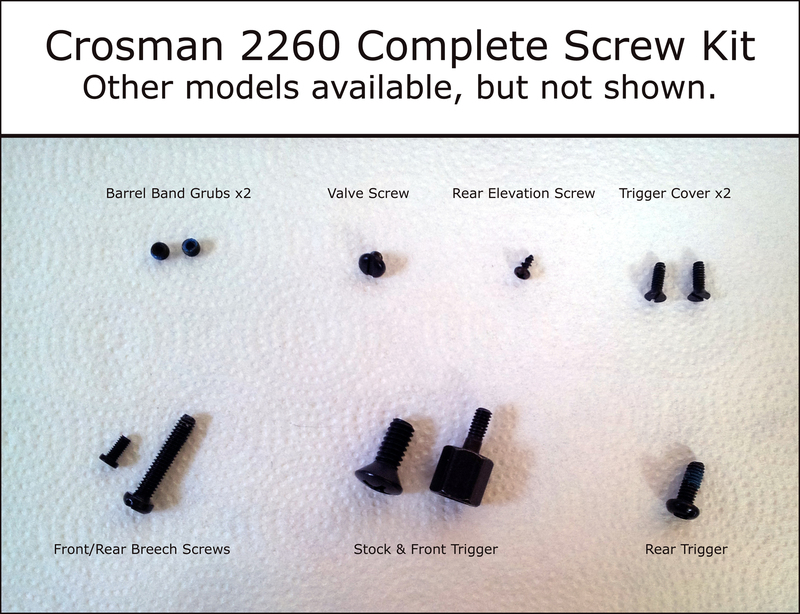 These are all genuine Crosman parts and are complete rebolt kits for project guns, rebuilds, etc. I also offer a Stainless Steel kit for the 2240 1322 and 1377. For the 2240, it includes ALL screws in stainless steel. Most are Torx, two are Phillips. For the 1322 1377, you also receive a Stainless Roll Pin. Finally, I offer a Brass Screw Kit for the 2240 1322 and 1377. It is a partial kit that includes all screws EXCEPT the Front Breech Screw and Valve Retention Screw (2240 only). Both Stainless and Brass Shoulder Bolt mods are in development, to replace the Roll Pin. Also available is a Shoulder Bolt upgrade to replace the Roll Pin on the 1377, 1322 or 2289. 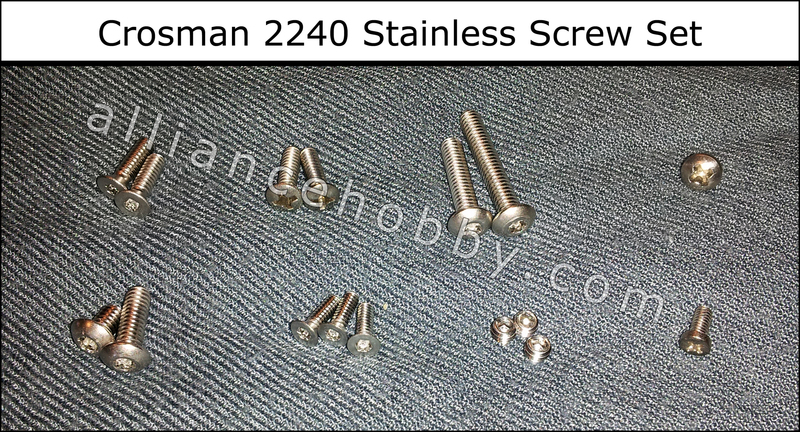 This listing is for a COMPLETE stainless steel screw set for the Crosman 2240, 1322, 1377. 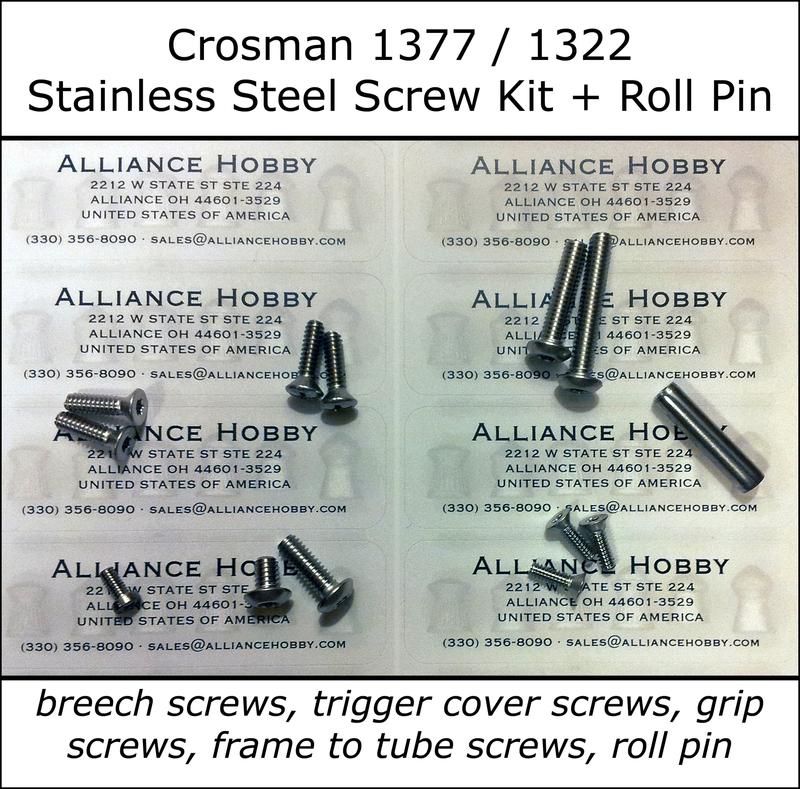 Unlike other listings, Alliance Hobby offers every screw in stainless. Most screws are Torx, with a couple Phillips, due to availability. Also, I know you may have a steel, aluminum or plastic breech. All require different quantities of fasteners. Alliance Hobby includes more than you'll need, so you'll always be covered. 13xx: Stainless Roll Pin, too! Also available is an economical, but fully functional precision tool kit, which contains bits for every fastener on the model. If you don't have access to Torx (especially T8), you may consider adding this to your purchase. 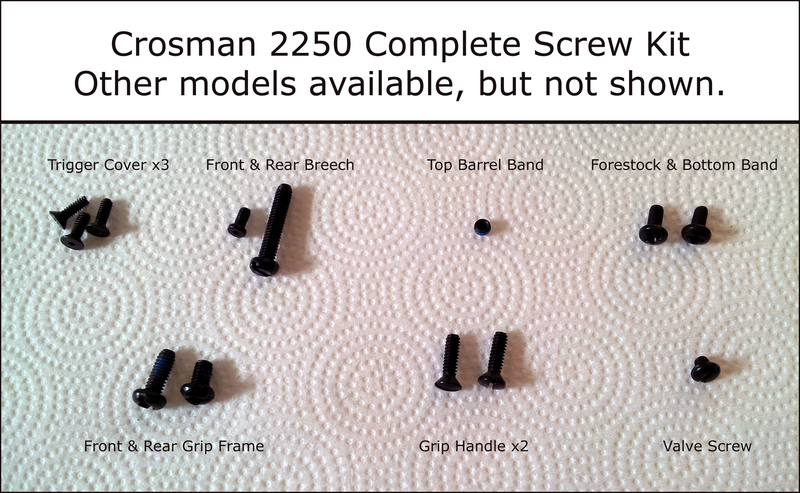 This listing is for a brass screw kit for the Crosman 2240 1322 and 1377. It will also partially fit the 2289 2250 and 2260. 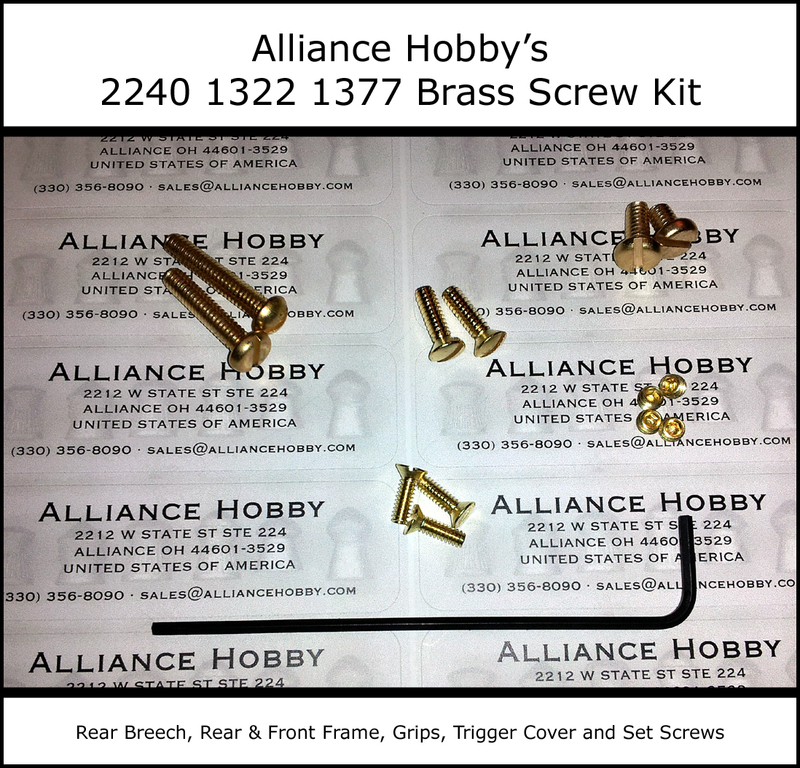 The following screws are included in the brass kit. This listing features a very cool upgrade consisting of a Stainless Steel or solid Brass Shoulder Bolt + Anchor Nut to upgrade your current roll pin on your Crosman pumper. The major advantage of this upgrade is that never again will you need to drive out and press back in your roll pin. Remove it this final time and toss it! From now on, remove this bolt in about 10 seconds with a wrech. The mod consists of driving your current pin out, slightly enlarging the pin hole (by about two thousandths), inserting the bolt and tightening the nut. 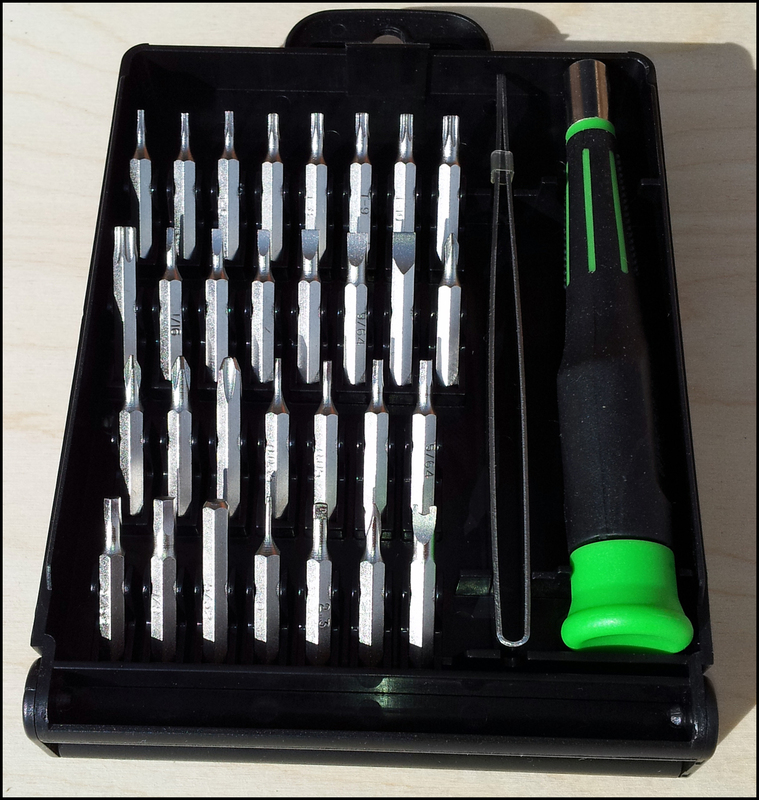 Kit includes: Shoulder Bolt & Nut of your choice, drill bit and hex wrench. You will need: Cordless or bench drill and small wrench (or pliers). Genuine Crosman Part Numbers. Blued Steel. All screws are included for models listed. Photos not shown for 13xx and 2289, but kits are available.